Signed C.L. within a circle and dated 1901. Watercolour, indian ink and heightening white on paper 94.5 x 62.5 cm. 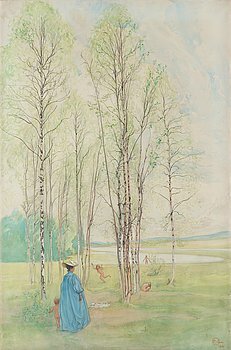 Sold by Carl Larsson to Pressens lotteri (The Art Lottery of the Swedish Press Association) according to notes in the artist's ledger: ”1901 I Grönan lund. Karin o. Bullerholmen / Pressens lotteri 1000”); Mrs. Gertrud Wikstrand, Stockholm; Hans Erik Börjeson Collection. Liljevalchs konsthall (Liljevalchs public art gallery), Stockholm, "Carl Larsson. Minnesutställning ", September - October 1953, no. 735 (under the title "De badande barnen"); Turku Art Museum, Turku, Finland, "Carl Larsson. Dreams of Harmony", September 16 2011 - January 8 2012 (under the title "Bathing Children"); Ateneum Art Museum, Helsinki, "Carl Larsson. In Search of the Good Life", February 10 - April 29 2012 (under the title "Bathing Children"). The composition was one of the illustrations in the publication "Larssons", originally published in 1902; Ulwa Neergaard, "Carl Larsson. Signerat med pensel och penna", 1999, catalogued under year 1901, p. 84, no. 975; "Carl Larsson. Dreams of Harmony" / "Carl Larsson. In search of the Good Life", exhibition catalogue Turku Art Museum, Finland / Ateneum Art Museum, Helsinki, 2011/2012, illustrated full page in colour, p. 100.